An alligator is a crocodilian in the genus Alligator of the family Alligatoridae. There are two living alligator species: the American alligator (Alligator mississippiensis) and the Chinese alligator (Alligator sinensis). They are closely related to crocodiles. Alligators are characterized by a broader snout and eyes more dorsally located than their crocodile cousins. Both living species also tend to be darker in color, often nearly black (although the Chinese alligator has some light patterning.) Also, in alligators only the upper teeth can be seen with the jaws closed (in contrast to true crocodiles, in which upper and lower teeth can be seen), though many individuals bear jaw deformities which complicate this means of identification. There are only two countries on earth that have alligators: the United States and China. The Chinese alligator is endangered and lives only in the Yangtze River valley. The American alligator is found in the United States from the Carolinas to Florida and along the Gulf Coast. The majority of American alligators inhabit Florida and Louisiana. In Florida alone there are an estimated more than 1 million alligators. The United States is the only nation on earth to have both alligators and crocodiles. American alligators live in freshwater environments, such as ponds, marshes, wetlands, rivers, and swamps. In China, they live only along the fresh water of the Yangtze River. Alligators are solitary, territorial animals. The largest of the species (both males and females) will defend prime territory; smaller alligators have a higher tolerance of other alligators within a similar size class. Although alligators have heavy bodies and slow metabolisms, they are capable of short bursts of speed that can exceed 30 miles per hour. Alligators' main prey are smaller animals that they can kill and eat with a single bite. Alligators may kill larger prey by grabbing it and dragging it in the water to drown. Alligators consume food that cannot be eaten in one bite by allowing it to rot or by biting and then spinning or convulsing wildly until bite size pieces are torn off. This is referred to as the "death roll." Alligators are opportunistic feeders, eating almost anything they can catch. When they are young they eat fish, insects, snails and crustaceans. As they grow they take progressively larger prey items, including: larger fish such as gar, turtles, various mammals, birds, and other reptiles, including smaller alligators. They will even consume carrion if they are sufficiently hungry. As humans encroach onto to their habitat, attacks on humans are not unknown, but are few and far between. The American alligator, Alligator mississipiensis, is found in swamps and sluggish streams from North Carolina to Florida and along the Gulf Coast. When young, it is dark brown or black with yellow transverse bands. The bands fade as the animal grows, and the adult is black. Males commonly reach a length of 9 feet and a weight of 250 lbs; females are smaller. Males 18 feet long were once fairly common, but intensive hunting for alligator leather eliminated larger individuals and threatened the species as a whole. The wild American alligator is now protected by law, but it is also inhumanely raised on farms for commercial uses. The Chinese alligator, A. sinensis, which grows to about 6 feet long, is found in the Chang (Yangtze) River valley near Shanghai. This species is nearly extinct. Alligators spend the day floating just below the surface of the water or resting on the bank, lying in holes in hot weather. They hunt by night, in the water and on the bank. Alligators hibernate from October to March. In summer the female builds a nest of rotting vegetation on the bank and deposits in it 20 to 70 eggs. The mother will defend the nest from predators and will assist the babies to water once they hatch. She will provide protection to the young for about a year if they remain in the area. Caimans are similar to alligators, but distinct members of the Alligatoridae family found in Central and South America. There are several species, classified in three genera. The largest grow up to 15 feet long. Unlike alligators, caimans have bony overlapping scales on their bellies. Baby caimans are often sold in the United States as baby alligators. Caimans and alligators are wild animals and should not be kept as pets for human amusement. Alligators and caimans are classified in the phylum Chordata, subphylum Vertebrata, class Reptilia, order Crocodilia, family Alligatoridae. American alligator populations were decimated by decades of hunting and habitat loss. In 1967 the animal was added to the federal endangered species list. The alligator recovered dramatically and was removed from the endangered species list in 1987. Alligators still face threats today, primarily from loss and fragmentation of natural habitats and encounters with people. The Chinese alligator's population reduction has been mostly due to conversion of its habitat to agricultural use. A majority of their usual wetland habitats has been turned into rice paddies. Poisoning of rats, which the alligators then eat, has also been blamed for their decline. It was also not uncommon for people to kill the alligators, because they believed they were pests, out of fear, or for their meat. In the past decade, very few wild nests have been found, and even fewer produced viable offspring. 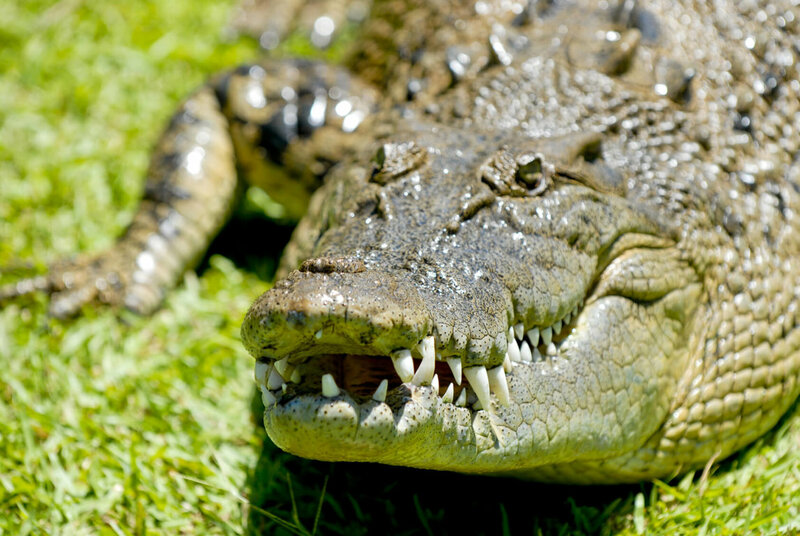 Collection for the exotic pet trade affects alligators. Every year, a variety of sources provides millions of animals to the exotic pet trade. Animals are captured from their native habitat and transported to various countries to be sold as “pets”. Others are surplus animals from zoos or their offspring. Backyard breeders also supply exotic animals. The sellers of these animals often disregard state or local laws regulating private possession of exotics, and the dangers, difficulties, physical and physiological needs of the animals they peddle. The suffering of the animals in the hands of unqualified and hapless buyers appears to be of no concern in the lucrative exotic pet trade. Reptiles pose safety risks to humans. Many incidents have been reported of escapes, strangulations, and bites from pet reptiles across the country. Alligators are also victims of the animal entertainment industry. The use of wild animals as “entertainers” removes animals from their natural habitat; depriving them of the ability to freely engage in instinctual behaviors. Both children and adults are desensitized to animal mistreatment by the animal entertainment industry. Even under the best of circumstances, captivity is cruel for wild animals. Confined to tiny areas and gawked at by crowds, animals in exhibits and acts endure constant stress. They may suffer from temperature extremes and irregular feeding and watering. Without exercise, they become listless, their immune systems are weakened, and they become prone to sickness; many resort to self-mutilation in reaction to stress or boredom. Mental illness is rampant among confined animals. Torn from their families and deprived of all dignity, every part of their lives is controlled by their captors. While zoos may appear to be educational and conservation-oriented, most are designed with the needs and desires of the visitors in mind, not the needs of the animals. Alligators also are inhumanely farmed commercially. Their hide is tanned and used to make leather goods such as shoes and handbags, while alligator meat is also considered a delicacy in many parts of the world.